Stuff required: A deck of playing cards with stickers, or index cards. Preparation: Depends how much effort you put into the cards. Time required: Half an hour or more. Place required: Any ambient background event. Activities: Chasing, hiding, deduction, ambient. The Central Council of Anarchists is in confusion, and while its members squabble over their exact rank and privilege, the solitary figure of Thursday slips through the crowd. Prepare a deck of cards. We used a cheap deck of playing cards with printed labels that also summarised the instructions (as pictured), but you can use index cards with handwritten days, if you're happy that all of the players will understand the rules. There should be twelve Sunday cards, twelve Monday cards, nine Tuesday cards, five Wednesday cards, one Thursday card, five Friday cards and nine Saturday cards. Shuffle the cards and hand them out over the course of the evening. This game is designed to be played as an ambient game at a larger event - a reason for strangers to strike up conversations, with occasional flurries of activity as Thursday is spotted, or rumoured to have been spotted. Each player has a card, with a day of the week on it. 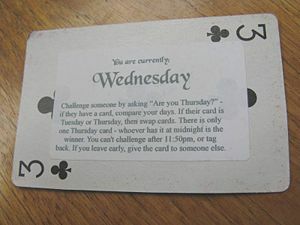 One card has Thursday on it, and whoever has the Thursday card when the game ends is the winner. As you wander around, you can challenge other potential players by asking "Are you Thursday?" - if they are playing, then you both show your cards. If the cards show adjacent days, you must swap them. Otherwise, you both keep your cards and walk away. You can't challenge anyone in the ten minutes before the end of the game, and you can't challenge someone straight back if you've lost your card to them (you have to go and challenge someone else first). The Man Who Was Thursday ran at Sandpit #4, which was running with a G K Chesterton theme. The woman who was Thursday spent the last half hour of the game hiding out in a corner of Battersea Arts Centre, and was given a copy of the book as a prize. This page was last modified on 13 January 2011, at 13:02. This page has been accessed 33,075 times.